Author(s) Jan van Harssel Jackson, Richard H Hudman, Lloyd E.
Produced in partnership with the National Geographic Society, this remarkable book helps you master the basic tenets of world geography while exploring established and emerging tourist destinations worldwide. The book begins with an overview of geographic concepts and an introduction to the global tourism industry, including the perspective of both hosts and guests. World destinations are covered in twelve sections divided into short, easy-to-digest chapters, each presenting regional geographic information and physical, cultural, and touristic details specific to individual countries and locations. Each destination features a flag, National Geographic map, descriptive introduction from the National Geographic Atlas of the World, key facts and data, travel and cultural tips, and information on significant tourist destinations and attractions. Each section contains National Geographic articles in the features "Insider Info," "Through the Visitor's Eyes," "City Highlights," and "Preserving the Future." In addition to extensive updates to reflect the latest trends and developments in world tourism, the Fifth Edition now features a vibrant, full-color design. 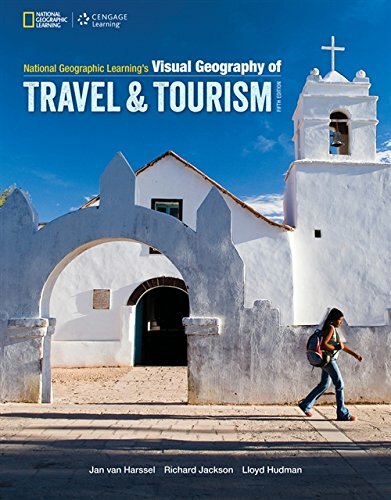 Ideal for avid travelers and aspiring hospitality, travel, and tourism professionals, NATIONAL GEOGRAPHIC LEARNING's VISUAL GEOGRAPHY OF TRAVEL AND TOURISM, Fifth Edition, is an engaging and informative guide to the world's varied and appealing destinations.